-Apple Macbook Pro: I use the 15 inch 2010 refresh Core i7. This machine rocks. I love it a ton! -Blue Microphones BlueBird Mic: I have owned a lot of Mic's and this is by far my favorite. Mostly because I think it looks spiffy. 🙂 But it also sounds pretty good too. 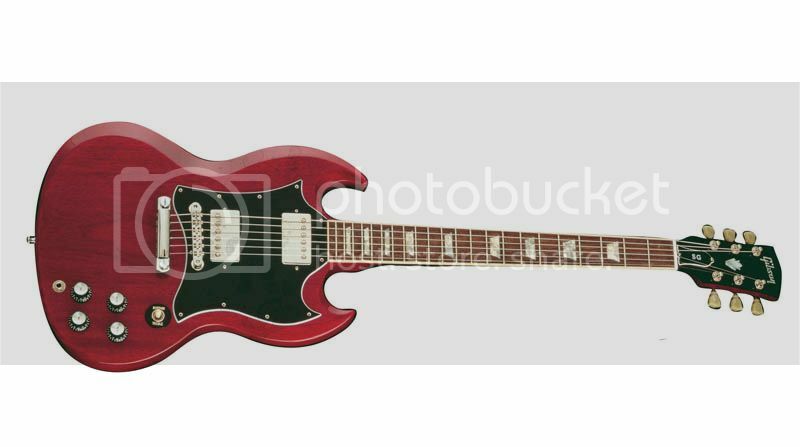 -Gibson SG in Cherry Red: Love this guitar. This is what I use to record all of my electric guitar tracks with anymore. I used to use an imitation fender strat for a long time, but I just love this guitar. It's so nice to play and the look and feel of it just do it for me. -Martin Custom X: This is my acoustic guitar. It's amazing. I've had it for a few years now and it's the one I use to play live and record with. It is the guitar on my website with all the nifty signatures. I love this guitar! -Apogee Duet: This is my firewire interface which I plug my guitar and mic into. -Yamaha VDrums: I mostly just use these to come up with drum beat ideas and play along with songs to get a feel for things. I rarely use these in recordings. There are a few songs that have these on them though. -Korg NanoKey: I really should get a full size keyboard. 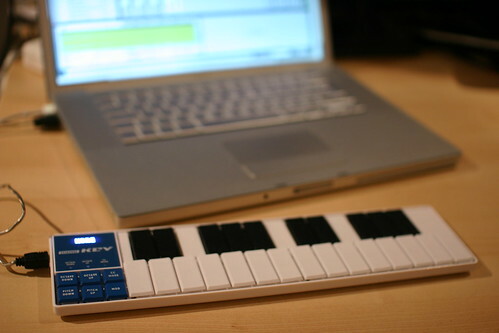 This is just a two octave tiny little USB powered midi controller that i use it to work out melodies and keyboard and organ tracks and some basslines. -TC Helicon VoiceLive 2: This is used in my live setup. I use this to make my vocals and guitar sound all pretty when I'm playing live! -Sennheiser HD 280 pro Headphones: These are used for recording and mixing and everything in between. -Audix OM5 Mic: this is used for playing live. -JBL EON 500: Another live only thing. I use this when PA system isn't supplied while playing live. It's portable and REALLY can get pretty loud! -Amplitube 3: this is what I use for my electric guitars. It gives me nice tones to play with. I plug my Gibson SG right into it and then bam I tweak this to give me some good guitar tones for recording. -Soundbooth: I use this for final touch up of the final wav file before I upload the track to the copyright office and then my website. Well that's the main deal. I'm sure there's something I missed like some of the iPhone apps i use to help come up with interesting and new chords to use in the songwriting process... or microsoft word for writing lyrics in. Or excel for keeping track of my set lists. Really though I figure that's probably a good rough idea of what I use. I always think i'm completely unprofessional with this whole music creation thing. But after writing that I realize that I have REALLY put a lot into this whole music thing. I suppose I am possibly semi legitimate. Even though sometimes I don't really consider my self very professional. So there ya go! 🙂 I hope you enjoyed reading about it as much as I enjoyed telling you. Tomorrow I am playing a show for an event related to Habitat for Humanity. It's such a great cause. Check out their site at www.habitat.org. I will be playing from 12:00 to 12:30. So that will be fun. I can't wait! Right now I'm practicing up my set list. So hopefully I will sound all nice and pretty. Today I decided to give away my 2 tickets that I had won at work to Hershey park instead of using them myself. I put up a small ad on craigslist. They went to the first person that responded. When I met the lady to give her the tickets she had her daughter with her and I swear I have never seen a kid MORE excited in my entire life for something. She was like literally jumping around with joy because they were going to hershey park tomorrow. It brought a smile to my face. I guess there's a lot of little things in this life that just make me smile. A big thank you to everyone who was there and as well to Infusion Coffee and tea! Good times. I then came home and finished production and mixing and mastering on a new song. Number 153... "Over The Bar Scene". The song was inspired by Kara Loomis who also took some fantastically awesome photos of me. So everyone if you need photos of any sort... Weddings or Portraits or anything check her out! She is a great wonderful person and easy to work with and I love her work. So yes the song is just about wanting someone and hoping they want you, and being in that place were you are watching all your friends get married and just kinda being ready to meet that special someone too. The idea is just that, sometimes you just don't want to go on any more first dates. Interpretation is up to the person observing the art. We're all dreamers and we're all observing each others creative side (That's me trying to be all witty and poetic). Anyways... I hope everyone else had such a fantastic day. Long answer... I've been working on a new song pretty much non stop for the past week. It's become one of my favorite songs that i've written. The recording process has also made me very attached to it. I hope everyone who listens will feel all that went into making the song. The recording session last night for the vocals went extremely well and that finishes up the recording tracks for the song. I will need to do a few touch ups on possibly acoustic guitar and vocals. I did a first mix out this morning and listened to it in the car... near the end I sorta kinda forgot it was my own song. It really sounds like something that you would hear on the radio! The song will be posted as always for free on my website in the next week hopefully. I still need to tweak some things but it should be up very soon. I can't wait for everyone to hear it! This is the fastest song i've ever written and recorded. In just one week I was able to go from just an idea and a piece of one lyric all the way to a finished first full mix. I wish all my songs could happen like this! Just wrote a song in 2 hours flat. I guess when you have the right muse things just happen fast. Now of course it still needs tweaks and it still needs to be recorded and all. But it's being moved from the writing folder to the recording folder as we speak to start recording. So a certain someone who I've been thinking about a whole bunch lately said something to me on June 10th.. ish... from my calculations it had to have been on that night. That something has been bouncing around in my mind all summer and it finally clicked with something else that's been bouncing around in my mind too. I decided that I want to write a duet about the topic. It's always funny when people inspire songs and they don't even do it on purpose or know that they inspired it. I guess that's how the songwriting person works... it's just kinda magical like that. So I'm writing a duet. Although I know nothing about writing a duet so if there are any female singer/songwriters that want to help me write this song I'd be interested in hearing from you. The song is supposed to be similar to something that one of the American Idol singers would sing. So I'm really going for something like that where you could see this being sung by the American Idol winners. If I could just like write songs and record all day. I'd have like a million songs already. I just constantly have idea's for songs it's just nuts. Sooo little time and sooo much music in my head! Dear someone in charge of finding unsigned musicians and making them rich... please come find me! 🙂 Thanks. Again, I need a ms. songwriter singer girl to help me write an American Idol esk ballad song thing that i'm working on.